Direct is what Instagram calls its messaging feature which allows users to correspond with one another without publishing to the public. According to The Verge, the photo sharing social network is testing a standalone Direct messaging app. This is the same path that Facebook took with Messenger a few years back, and considering Facebook owns Instagram, the move isn’t completely out of left field. Instagram is testing the app right now in Chile, Israel, Italy, Portugal, Turkey, and Uruguay for both Android and iOS users. 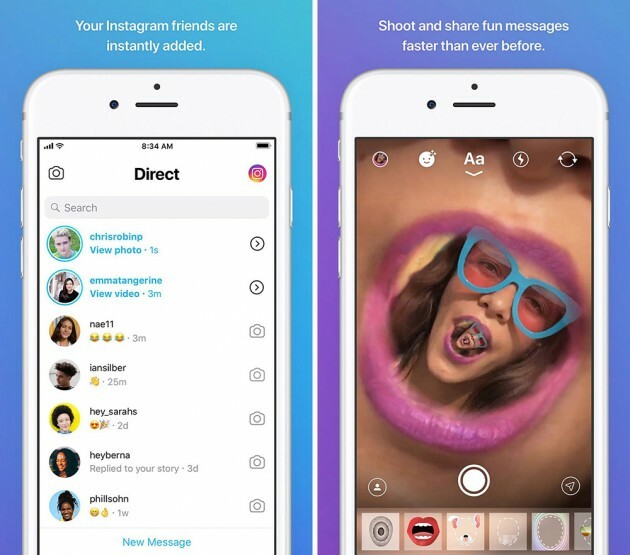 The app will open up with the camera in a similar fashion to Snapchat, and installing the standalone Direct app will actually remove the Direct feature from the standard Instagram app. So if you want to direct message someone, you won’t be able to do it from the main app anymore with Direct installed. Direct works how you might expect, in that you can swipe to the right to access your profile (and settings), and then swipe to the left from the camera to open your inbox of messages. The app is very to the point, as an app of this nature should be. Opening up directly to the camera should make it pretty simple to start sharing on the fly. Interestingly, Instagram is also including a quick way to switch between the Direct app and Instagram proper. If you swipe to the right while in the Direct inbox, you’ll get a little transition of the Instagram logo that will fully expand and automatically launch Instagram. And if you swipe right in the same fashion within Instagram, you’ll see the Direct logo and you’ll jump into the Direct app.